Imagine how delighted I was when I stumbled upon this Mexican casserole, which isn’t like a casserole at all, but rather a spicy pasta. 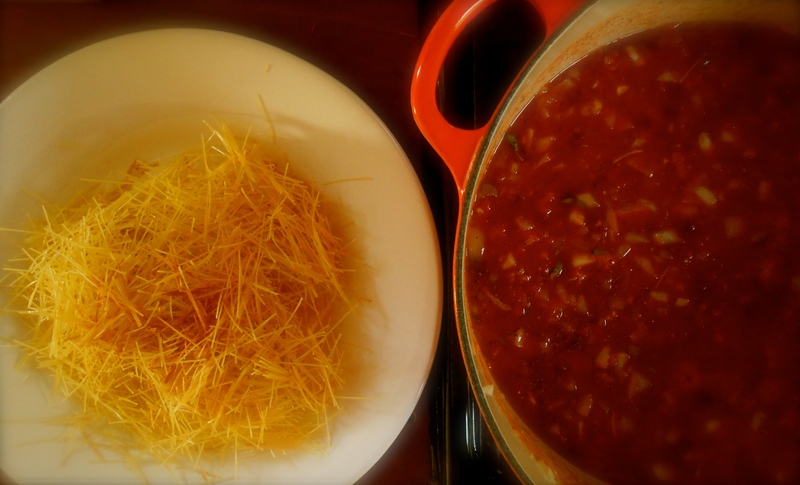 Thin pasta (fideo), such as capellini is cooked in a spicy tomato soup until the noodles absorb all the liquid; resulting in a dry soup (sopa seca). After breaking the capellini into two inch pieces and cooking in a skillet with a little olive oil they swell and become crunchy. Mixing them into the spicy tomato soup and baking for 2o minutes a wonderfully textured combination of a soft and crunchy pasta is achieved. We like it spicy and this recipe has quite a bit of smoked jalapeños in adobo sauce. Add chiles according to your HOT threshold. This recipes calls for chicken, but of course you could omit and enjoy this vegetarian style. This dish has similar qualities of chilaquiles which was posted here last July. Chilaquiles are basically corn tortilla pieces that are fried, cooked in a spicy tomato salsa, and sprinkled with cheese. Often served for breakfast with an egg. 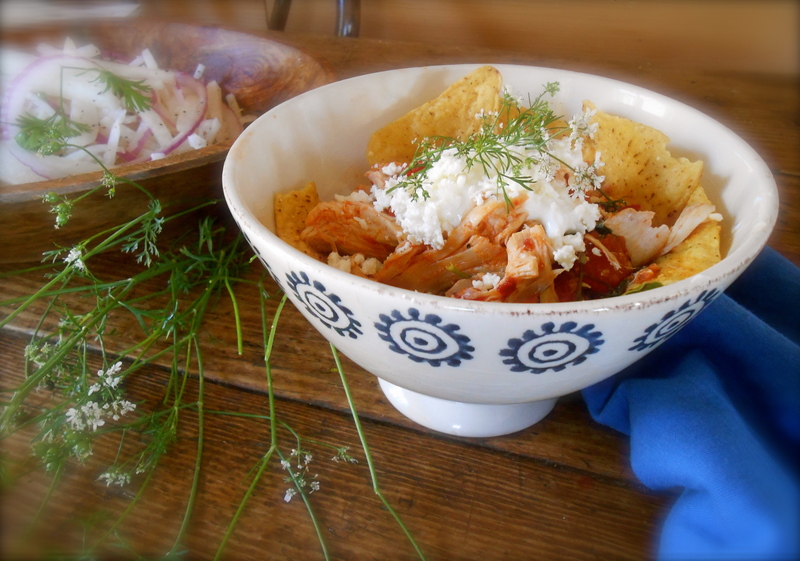 My version of chilaquiles is served on top of crunchy tortilla chips. c h i l a q u i l e s – posted last July. Preheat oven to 375°F. Lightly butter a 2 quart baking dish or oven proof skillet; set aside. In a skillet heat 2 tablespoons of the oil over medium heat. Add pasta; cook about 5 minutes or until evenly toasted, stirring occasionally. Transfer pasta to a plate; set aside. Using the same skillet heat remaining 1 tablespoon oil over medium heat. Add onion and garlic; cook for 7 to 10 minutes being careful not to brown, cook only until tender. Stir in coriander and cook for one minute or until fragrant. Stir in tomatoes, stock, chipotle chile peppers and oregano. Season with salt and pepper. Bring to boiling. Reduce heat and simmer for 10 minutes, stirring occasionally. Carefully stir in chicken and pasta. Pasta will need to be stirred gently. Transfer mixture to prepared baking dish. Top mixture with cheese. Bake for 20 minutes or until casserole is bubbly and starts to brown. Serve with avocado and freshly snipped oregano. It must be related to Spanish fideuà – a kind of pasta version of paella with pasta (spaghetti type) cut into smaller pieces – even if the Mexicans spell it fideo. All sorts of combinations possible, but I like your chicken version. Lovely. I have not hear of Spanish fideuà. I’ll have to look it up, it sounds like something I would love. It is true, even for this Mexican version, there are so many combinations. It’s a wonderfully warming dish. I read about it and cooked it from Sam(uel) & Sam(antha) Clark’s fabulous cookbook, Casa Moro. I love that you are as in love with Mexican food as I am– this looks great. I have never had or made this dish– I will have to try it! I have always loved both Mexican and Italian food. I love flavor! Interesting too because I grew up on fairly simple, somewhat bland foods. Well, not really “bland”, but just not spicy or garlicky. I love dry soups, soup where the pasta absorbs the broth. Love the spicy tomato broth and the Mexican flavor. This was the first dry soup I have ever had. I didn’t even know it existed! I certainly loved it and will be experimenting with other flavors. Have you made dry soup before? What flavors did you incorporate? Curious. Yes when I lived in Italy i learned how to make pasta piselli, same basic method as your sopa seca without the spices and tomato. Chicken broth, peas, egg, pasta (capellini) parm or romano cheese. It’s delicious. I know I posted on food52 and think it’s on my blog. Have to check. Sounds lovely! Please let me know where to find it…I’ll make it for sure. Here is a link, I love this dish it’s delicious. I have never eaten this soup but I like the sound of it and look of it. Avocado on the top too! Couldn’t be better, my spoon is ready. Same here Maria. I had never had it before either. Have to admit, I did overeat! I made a enough “to feed an army” and there was only three of us. It was good for lunch the next day too. Thank you for visiting my blog, I look forward to staying in touch! this kind of soup is right up my alley – bright and fresh, especially for a dreary winter day like today. OMG these are my favorites! 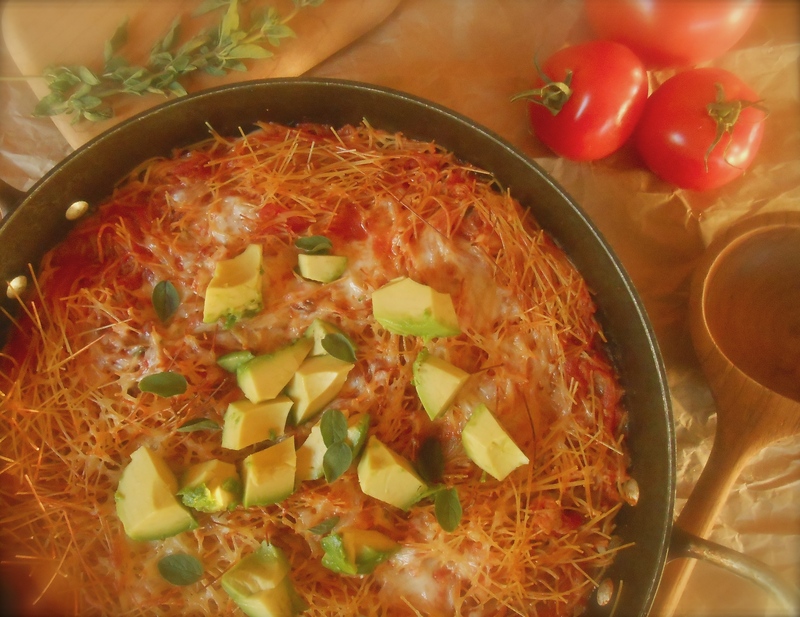 I love paella made from fadeos and I love avocados and chilaquiles! You’re inspiring me to make this! Smoked jalapenos and adobo….yes! Beautiful photos! I must look into paella made from fadeos. I’m inspired! Make this one Amanda. It’s everything you imagine it to be; spicy, heavenly pasta both crispy and soft, smokey and a bit hot. Love the fresh oregano! This looks amazing, just pinned for a dinner this week. Just found your site a few weeks ago and I think it is lovely. Your photo grabbed my attention, I’ve never come across dry soup before so have learnt something new today. Looks and sounds truly delicious. Thank you so much. The recipe stopped me dead in my tracks when I stumbled upon it. It’s so wonderful and I’m going to keep making dry soups. New to me too and so glad to have discovered it. Makes me realize all the fabulous recipes and cuisines I have not heard of, keep them coming…right! What an unusual soup Seana – this is completely new to me too! I love the sound of the flavours and the look is so striking! Yum! We made fideos recently and kept it vegetarian with loads of mushrooms and fresh peppers, though I like the addition of chicken for a more substantial meal. I am quite smitten with this dish! Really? That sound great! I have been thinking about all the other ingredients which could be used with this dry soup. I really love this dish and I’m going to keep making it. And you know, I think I may enjoy it more without chicken or meat! :) I’m smitten too…. I’ve never, ever heard of a dry soup before! And absolutely intrigued by the pasta, as it’s something I would never normally have in a soup. I’ll have to have a look at what pasta is available as it might not be possible to buy this angel hair, or very fine pasta. And I also like the coriander, rather than cumin, with the toms. Again, I don’t think I’ve tried that. Nice choice! We ate a lot of fideos the years we lived in Spain– but never saw dry soup!! The ingredients make it look delish!! Thanks for the inventive recipe!! Must of been a wonderful time in Spain, eating fideos… This is a nice one for sure. Nice to see you here Rhonda. Oh, how I would love to try this. Looks delicious and beautiful! Well, I hope you do Lidia. Doesn’t get much better than this as far as my palate is concerned. It has it all, heat, tomatoes, pasta, fresh oregano…it is wonderful. I never heard of this but it does sound delicious. Your photos are so pretty! Me too. hahahah. I’m starving! I’ve never made a dry soup, but it looks and sounds really good! Give it a try Nancy! It’s very nice, you’ll love it. Suzanne, from apuginthekitchen, says she makes it Italian style and that sounds really good too! Thanks “saucy”! Great soup for sure, more like a pasta really…but something new to me and we really enjoyed it. Love learning about new foods, especially from other regions. Good week to you! I love Mexican food but have never made this dish…I’m sure I would enjoy it as it has lots of flavors going on. Thank you Karen. Thanks for stopping by and I’m really looking forward to making your stroganoff! This weekend, for sure. I’ll let you know how it goes. Looks so yummy! and I love Mexican recipes that go beyond Tex Mex. I think I’ve had enough carbs for a week and we’re only at Tuesday, haha (I could live on pasta and rice), but I’m definitely doing this! This looks/sounds like perfection. LOVE that it is served with avocados! Your family eats well! Thank you Azita…. Avocados made the dish…delish! That and the fresh oregano. This looks really delicious. I love the fine pasta. A great thought. This one especially looks fabulous. Beautiful. Delicious. Perfect. As always…. Perfect. I seriously can not stop with the spicy foods right now. Doesn’t jalapeños and chile peppers have large doses of vitamin C? Most likely I’m craving the heat because I’m deficient! Believe it or not, I almost ate the whole pot myself over the course of two days. And, as always, you are too kind with your compliments Prudy. Talk soon! Now this looks crazy good. Perfect for the winter chill. Love that you can’t stop with the spice! How did I miss this one? another one I’d like to try. Wouldn’t it be so much easier if you just lived next door and we traded off dinners! hahaha! I think it would make things much easier and nicer! I am just now at your blog visiting and I saw your comments come through! We are visiting at the same time. Cool! This sounds great. I love Mexican food but have not heard of this dish and am intrigued; do the noodles become soft as they bake or crunchy? You are currently reading sopa seca de fideo con pollo at COTTAGE GROVE HOUSE.